AS OF 2014 THE ART CONTEST HAS BEEN SUSPENDED. Students in grades K-12 celebrated the 30th Anniversary of the Pequest State Trout Hatchery by participating in the NJ DEP Division of Fish and Wildlife's 2013 Trout Art Contest. 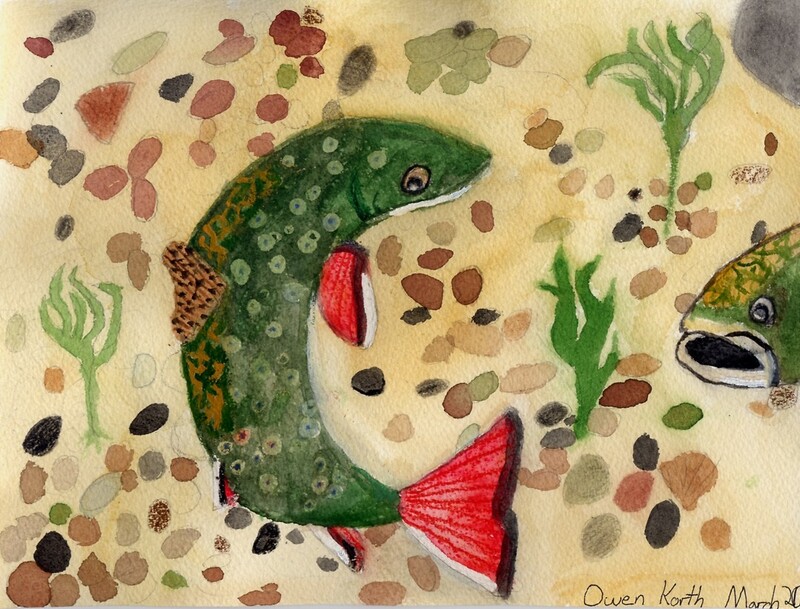 To mark the 30th Anniversary of the Pequest Trout Hatchery, students were asked to draw a picture of one of the three kinds of fish raised at Pequest - brook, brown or rainbow trout. Students chose one of these three fish and drew a picture of the fish in its NJ habitat. The artwork needed to be creative and original and include correct biological and ecological information about the fish and its habitat. The drawings were done in any medium but the finished size needed to be on 8.5 x 11 inch paper. All submitted artwork became the property of the NJ Division of Fish and Wildlife and was not returned. First place winners were chosen from each grade level. 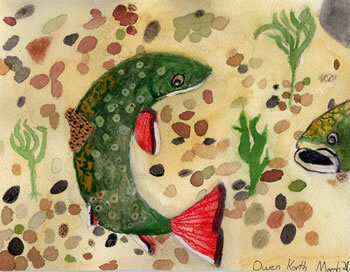 All winning artwork will be on display at the Pequest Trout Hatchery and Natural Resource Education Center for one year. Winners were invited to fish in the famous Pequest Education Pond (which is stocked with fish from the hatchery) on Opening Day of Trout Season, April 6, 2013. All winners received a certificate, fishing equipment and a youth membership to Trout Unlimited, which was presented to them at a special awards ceremony, followed by a luncheon for winners and their immediate family. The ceremony and luncheon were held at the Pequest Trout Hatchery. After the luncheon, winners and their families were invited for a special "behind-the-scenes" tour of the Pequest Trout Hatchery and will get time after the tour to experience our newly renovated Exhibit Hall, which was reopened during the annual Open House, March 23 and 24, 2013. The contest deadline was Friday, March 1, 2013; winners were notified by March 16.